Analyze the changes in the water regimen that have occurred during known intervals. Surface and ground water resources. Effects of development on ground water. Maps, graphs. Description of basin. White, N.D. and Childers, D. 1967. Hydrologic Conditions in the Douglas Basin, Cochise County, Arizona: Arizona State Land Department, Phoenix, Water Resource Report 30, 26 pp. Basic ground water data that are useful in planning and studying water resources development. Data consists of well data, logs, well discharges, reported drawdowns, drill cuttings, water-level measurements. Includes maps. Brown, S.G., Schumann, H.H., Kister, L.R. and Johnson, P.W. 1963. 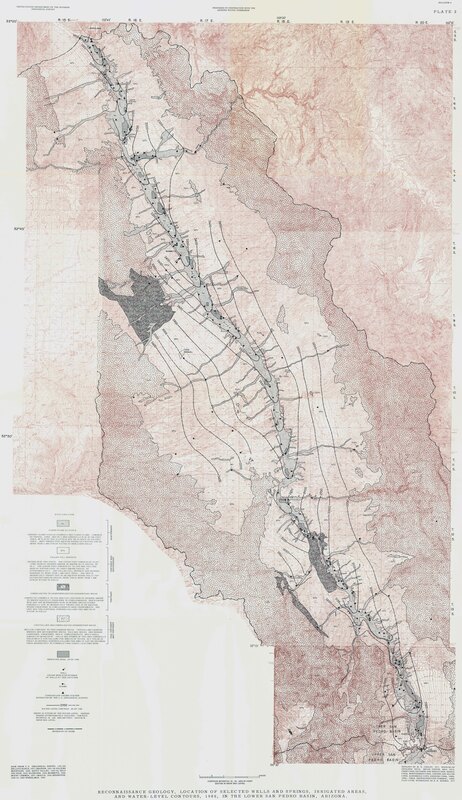 Basic Ground Water Data of the Willcox basin, Graham and Cochise Counties, Arizona: Arizona State Land Department, Phoenix, Water Resource Report 14, 83 pp.